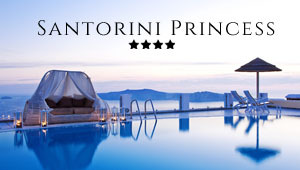 Want to book Santorini sightseeing tours? This is the right place. We suggest many interesting Santorini tours and excursions, ideal especially if you are visiting the island for few days or even few hours. See all you have to see quickly and conveniently. The most popular tour in Santorini is certainly the boat trip to the volcano and the hot springs. Walk on top of a still active volcano, see the caldera villages from an impressive spot and swim in thermal water with therapeutic ingredients. Some volcano boat tours continue to the tiny island of Thirassia and end up in Oia at the sunset time. Very convenient are also the bus tours in Santorini. These bus tours offer guided visit to the Minoan town of Akrotiri, the most important archaeological site on the island, continue with visits to traditional winery, lovely beaches and villages and eventually finish with visit to Oia village at sunset. As the tourist season on the island is extended, Santorini tours usually take place from April to October.